Some 400,000 units of the new Nintendo 3DS sold on Saturday, reports Nikkei, veritably selling out the first shipment and requiring reinforcements on Sunday. Long lines for the device were a common sight on debut day. Andriasang, which noticed the Nikkei report, noted that stores in Tokyo's famed Akihabara district, didn't disclose they had units for sale freely (as opposed to pre-order pickups) until just before closing on Friday night - and still had lines numbering 700 and 1,000 people long by morning. By 9:30 a.m. their stock had vanished. The next shipment was due to arrive Sunday (it is now Monday in Japan). Andriasang says the new handheld "is totally available," and notes a conspiracy theory holding that Nintendo is keeping the supply steady in order to depress gray-market resales. Nikkei says Nintendo intends to ship 1.5 million systems for Japan by March 31, and 4 million worldwide by the same date. 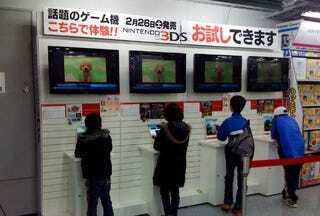 The 3DS releases in the UK on March 25, North America on March 27, and Australia on March 31.